Wisconsin Historical Society Press, 9780870208577, 240pp. Farm boy professor shares a life of lessons. 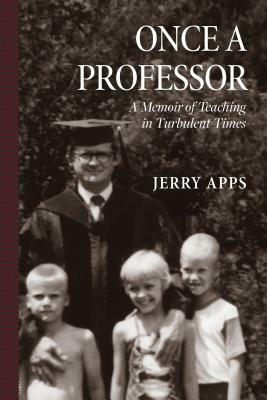 “I never wanted to be a professor,” writes Jerry Apps in the introduction to Once a Professor. Yet a series of unexpected events and unplanned experiences put him on an unlikely path—and led to a thirty-eight-year career at the University of Wisconsin. In this continuation of the Apps life story begun in his childhood memoir Limping through Life, Wisconsin’s celebrated rural storyteller shares stories from his years at the University of Wisconsin–Madison from 1957 to 1995, when he left the university to lecture and write fulltime. During those years Apps experienced the turmoil of protests and riots at the UW in the 1960s, the struggles of the tenure process and faculty governance, and the ever-present pressure to secure funding for academic research and programs. Through it all, the award-winning writer honed a personal philosophy of education—one that values critical thinking, nontraditional teaching approaches, and hands-on experiences outside of the classroom. Colorful characters, personal photos, and journal entries from the era enrich this account of an unexpected campus career. Jerry Apps has a PhD degree from the University of Wisconsin–Madison School of Education. He worked for the University of Wisconsin for thirty-eight years in varying roles, from county extension agent to tenured professor. He is a past director of the National Center for Extension Leadership Development. In addition to his many books on rural history, he has written eleven books on continuing and higher education. Jerry and his wife, Ruth, split their time between their home in Madison and their farm in central Wisconsin.